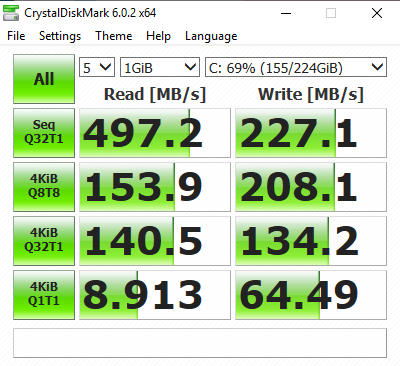 I'm not too familiar with SSD nor Windows, but - are those test results ok for my setup, or are they indeed slow, as userbenchmark reports? If they are slow - where should I be looking? BIOS or windows drivers? I think you should get 400MB/s read speed at least. Did you fully update Windows 10? Can you try more common CrystalDiskMark? Anyway, I'm not familiar with Windows either. You're right, CrystalDiskMark shows better numbers. 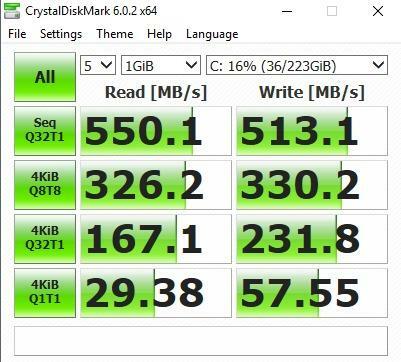 BTW, that SSD is quite affordable. They are a little bit faster normally.